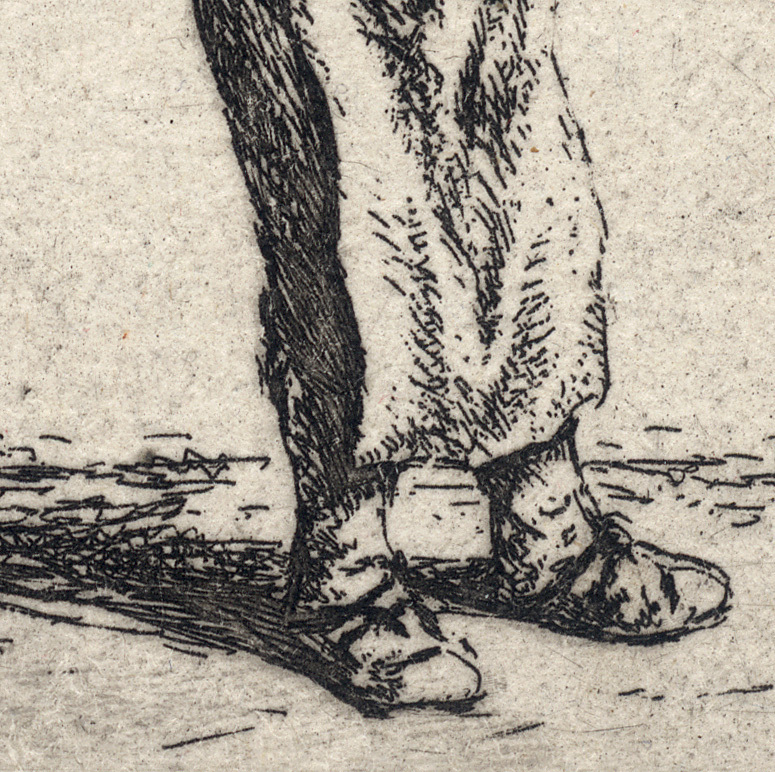 Etching with light plate tone on laid paper trimmed to the image borderline with a fillet of paper outside the borderline. The print is backed with a support sheet. 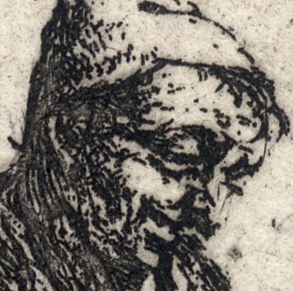 Inscribed on plate with the artist’s monogram: (lower left) "AvO"
State iv (of vi) with the additional strokes on the back of the neck. See also: “Everyday life in Holland's Golden Age: The Complete Etchings of Adriaen van Ostade”, ex. cat. 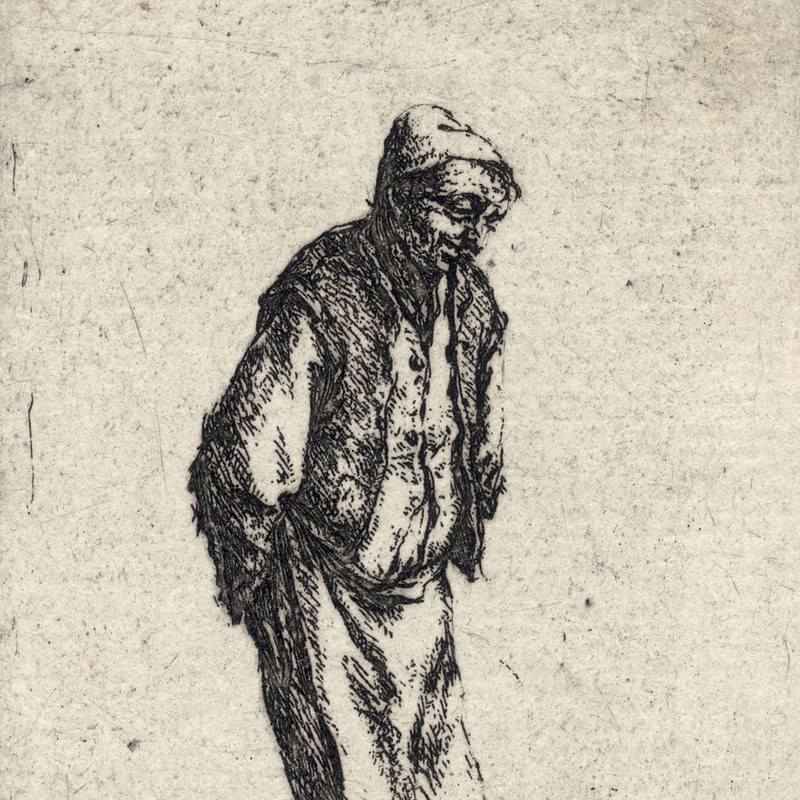 Rembrandthuis, Amsterdam, 1998, no.21. Condition: crisp, well-inked and well-printed impression showing some wear to the plate in excellent condition (i.e. there are no tears, holes, folds, abrasions, stains or foxing). The sheet is trimmed to the image borderline and laid onto a support sheet of archival (millennium quality) washi paper. I am selling this famous etching of single figure full of life and spirit from Ostade’s middle period for AU$236 in total (currently US$184.20/EUR149.50/GBP129.20 at the time of posting this listing) including postage and handling to anywhere in the world. 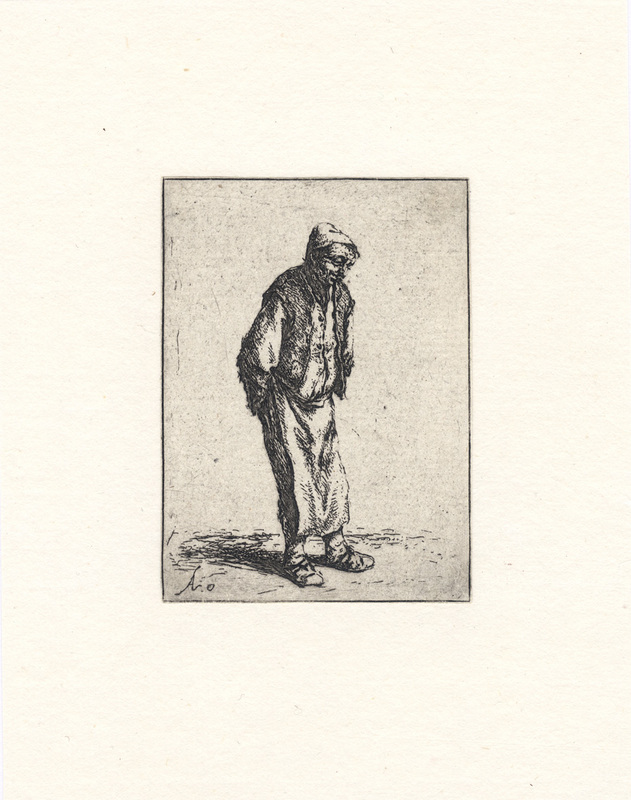 If you are interested in purchasing this small but visually engaging etching from one of the truly great masters of the 17th century, please contact me (oz_jim@printsandprinciples.com) and I will send you a PayPal invoice to make the payment easy. 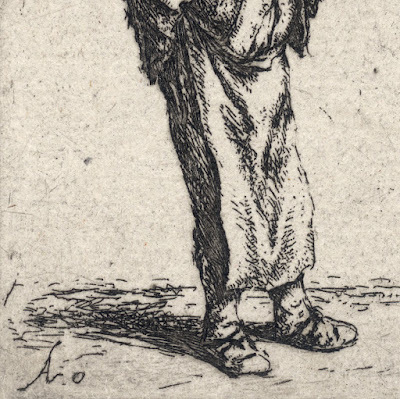 Interestingly, the apron and vest that this rather kindly looking man wears suggests that he is unlikely to be any of the occupations that the three formal titles for this print propose; viz., peasant, farmer or beggar. Indeed, as Leonard J Slatkes et al. 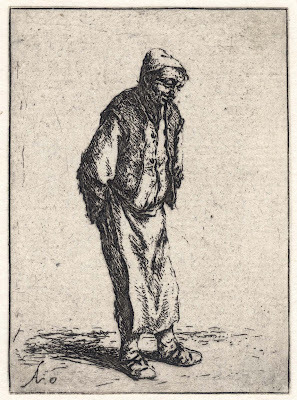 (1994) in “Adriaen van Ostade: Etchings of Peasant Life in Holland’s Golden Age” (exh. 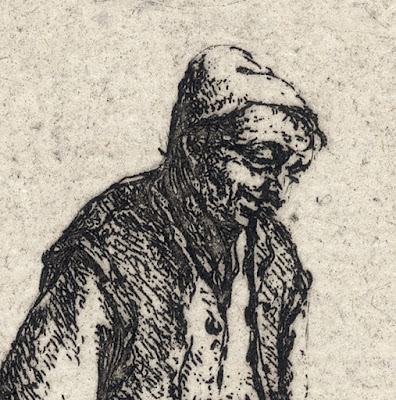 cat., Georgia Museum of Art) insightfully suggests “perhaps he is a village shopkeeper or even an artisan” (p. 120). After all, there are a number of other prints by Ostade featuring men in aprons attesting to Slatkes’ proposals for the man’s occupation. 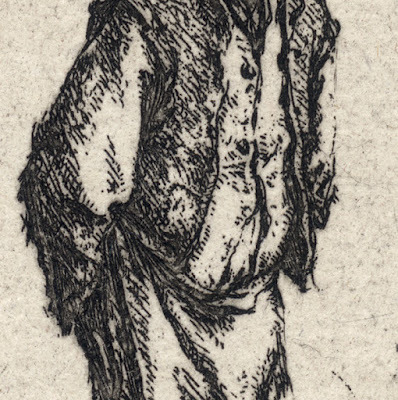 Regarding Ostade’s choice to portray a single figure without a surrounding context, Slatkes et al. 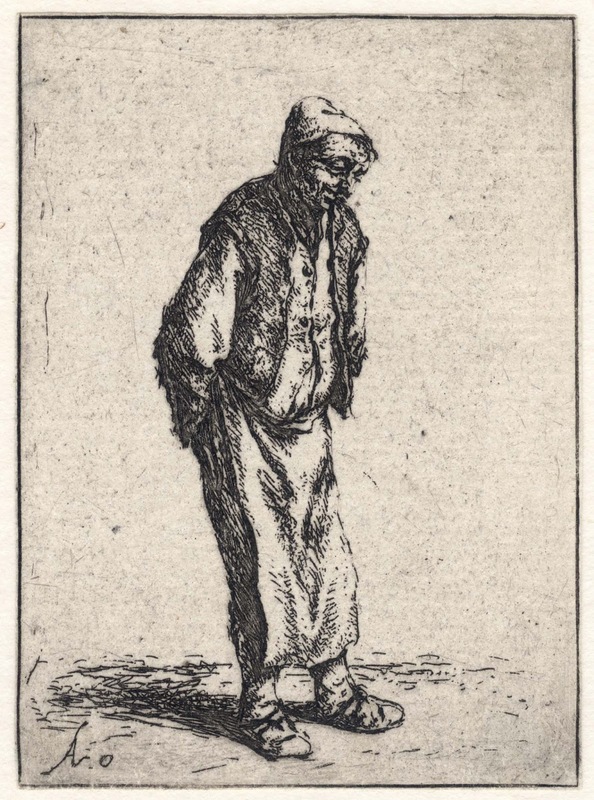 (1994) makes the point that “it seems likely that Rembrandt’s various single-figure etchings of country folk, beggars, and other plebeian types may have inspired Ostade to produce single-figure print such as this one” (ibid).